(Phys.org) —On July 2, NASA successfully launched its first satellite dedicated to measuring carbon dioxide in Earth's atmosphere. The Orbiting Carbon Observatory-2 (OCO-2) mission—operated by NASA's Jet Propulsion Laboratory—will soon provide atmospheric carbon dioxide measurements from thousands of points all over the planet. Last week, the satellite reached its proper orbit—meaning that it is now beginning to return its first data to Earth. Data from the satellite will be used to help researchers understand the anthropogenic and natural sources of CO2, and how changing levels of the greenhouse gas may affect Earth's climate. But before OCO-2 provides scientists with such a global picture of the carbon cycle—where carbon is being produced and absorbed on Earth—researchers have to convert raw satellite data into a CO2 reading and then, just as importantly, make sure that the reading is accurate. A team of Caltech researchers is playing an instrumental role in this effort. As it orbits, OCO-2 provides data about levels of atmospheric CO2 by measuring the sunlight that reflects off Earth, below. "OCO-2 measures something that is related to the CO2 measurement we want but it's not directly what we want. So from the reflected light, we have to extract the information about CO2," says Yuk Yung, the Smits Family Professor of Planetary Science. The process begins with the satellite's instrument, a set of high-resolution spectrometers that measure the intensity of sunlight at different wavelengths, or colors, after it has passed twice through the atmosphere—once from the sun to the surface, and then back from the surface to space. As the satellite orbits, systematically slicing over sections of Earth's atmosphere, it will collect millions of these measurements. "OCO-2 will provide the measurements of this light at different wavelengths in millions of what we call spectra, but spectra aren't what we really want—what we really want is to know how much carbon dioxide is in the atmosphere," Yung says. "But to get the CO2 information from the spectra, we have to do what's called data retrieval—and that's one of my jobs." The data retrieval method that Yung and his colleagues designed for OCO-2 compares the light spectra collected by the satellite to a model of how light spectra would look—based on the laws of physics and knowledge of how efficiently CO2 absorbs sunlight. 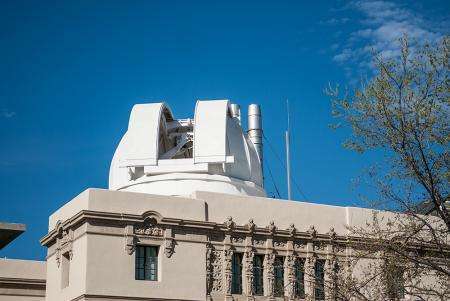 This knowledge, in turn, is derived from laboratory measurements made by Caltech professor of chemical physics Mitchio Okumura and his colleagues at JPL and the National Institute of Standards and Technology. "To make scientifically meaningful measurements, OCO-2 has to detect CO2 with better than 0.3 percent precision, and that has meant going back to the lab and measuring the spectral properties with extraordinarily high precision," Okumura says. From this retrieval, the researchers determine the amount of CO2 in the atmosphere above each of OCO-2's sampling points. However, when OCO-2 sends its first CO2 measurements back to Earth for analysis, they'll still have to go through one more check, says Paul Wennberg, the R. Stanton Avery Professor of Atmospheric Chemistry and Environmental Science and Engineering. "Although the OCO-2 retrieval will calculate the amount of carbon dioxide above the point where the spectrometers pointed, we know that these initial numbers will be wrong until the data are calibrated," Wennberg says. Wennberg and his team provide this calibration with their Total Carbon Column Observing Network (TCCON), a ground-based network of instruments that measure atmospheric CO2 from approximately 20 locations around the world. TCCON and OCO-2 provide the same type of CO2 measurement—what is called a column average of CO2. This measurement provides the average abundance of CO2 in a column from the ground all the way up through Earth's atmosphere. About once per day, the OCO-2 instrument will be commanded to point at one of TCCON's stations continuously as it passes overhead. 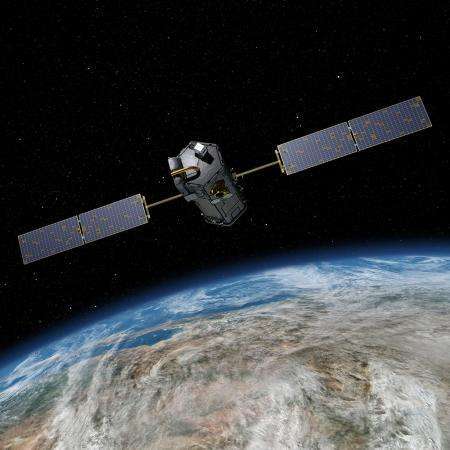 By comparing the Earth-based and space-based measurements, researchers will evaluate the data that they receive from the satellite and improve the retrieval method. The complete, high-quality information OCO-2 provides about global CO2 levels will be important for researchers and policymakers to determine how human activity influences the carbon cycle—and how these activities contribute to our changing planet. "A lot of the very first satellites were developed to study astronomy and planets far away. But there has been a shift. Our changing climate means that we now have a big need to study Earth," and the information OCO-2 provides about our atmosphere will be an important part of filling that need, says Yung.